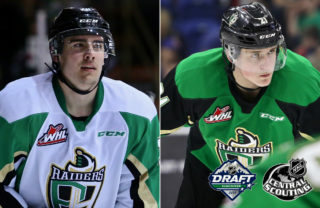 Cranbrook, BC – Noah Gregor scored his first career WHL hat trick as the Prince Albert Raiders (40-6-0-2) skated to a 7-3 victory over the Kootenay ICE (10-30-7-1) at Western Financial Place on Saturday night. Gregor’s three goals in the game also give him 30 in a season for the first time in his career. The line of Dante Hannoun, Parker Kelly, and Spencer Moe also had a big night. Each had a multi-point effort and the line combined for four goals and 10 points. Justin Nachbaur also had a multi-point night with a pair of assists. The Raiders jumped out to the lead just 58 seconds into the game. Moe got past the corner on the ICE’s defence and put a shot on goal that was stopped by Jesse Makaj. The trailing Hannoun found the rebound and buried it for his 23rd goal of the year. SCORES! @hannoun19 buries a rebound off a @spencerm04 attempt! About three minutes later, the Raiders increased the lead. With Brayden Pachal in the box, Hannoun and Kelly broke in on an odd-man rush. 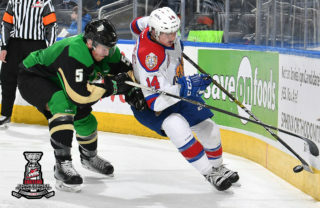 Hannoun passed it to the Ottawa Senators prospect who converted the one-timer for his 23rd of the season at the 4:03 mark. SCORES! @Parks_17 pots a shorthanded goal on an odd-man rush with Dante Hannoun! Midway through the first, the ICE cut into the lead. Peyton Krebs’ backhanded saucer pass from the halfboards found Brad Ginnell in front who beat Boston Bilous at the 9:32 mark. In the second, the Raiders again struck early. Gregor picked the corner on Makaj just 12 seconds into the period for his 28th of the year. SCORE! @n_gregs20 snipes it past Makaj! The Raiders appeared to make it a 4-1 game shortly after. An ICE defender collided with Makaj at the top of the crease. After a clearing attempt that was kept in the zone by Max Martin, the puck found its way to Sean Montgomery who deposited the puck into the empty net. However, the goal call was reversed due to Makaj losing a skate blade. The ICE responded with a shorthanded goal of their own. Jakin Smallwood elected to keep on an odd-man rush and snapped a shot past Bilous to make it 3-2 at the 7:30 mark of the second. The Hannoun-Kelly-Moe line connected again to restore the Raiders’ two-goal lead. Kelly sprung Moe with a breakaway pass into the ICE zone. The Calgary product used a forehand-backhand move to solve Makaj with 6:56 to play in the middle frame. SCORES! @spencerm04 goes forehand backhand! Gregor struck again with 4:51 to play in the period. The San Jose Sharks prospect streaked down the left wing and beat Makaj with a shot that went in and out of the net in a hurry. It was Gregor’s 29th goal of the year and fourth shorthanded. SCORES! @n_gregs20‘s second goal of the period is a shorthanded marker! In the third, Gregor tallied his hat trick goal at the 7:10 mark of the third. The Beaumont, AB product collected the puck in the corner, circled the zone, skated into the slot and snapped a shot that knocked Makaj’s water bottle off the top of the net. SCORES! @n_gregs20 completes the hat trick! Less than two minutes later, the Raiders scored their seventh of the night. 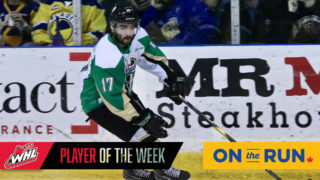 Moe dished it to Kelly who dropped it to Hannoun and the Delta, BC product wired a shot past Makaj for his second of the night and 24th of the year. SCORES! @hannoun19 with his second of the game! Late in the third, the ICE made it a 7-3 game. Kootenay entered the zone with a three-on-one. Bilous broke up the first shot, but Connor McClennon banged home the rebound to round out the scoring. Bilous got his second win in as many starts with the Raiders, making 13 saves for his fifth total win on the year. Makaj stopped 28 Raider attempts in a losing effort. 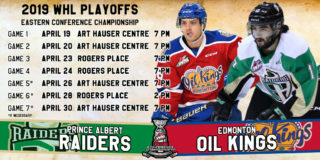 The Raiders return to the Art Hauser Centre next weekend for a pair of games, beginning on Friday night against the Edmonton Oil Kings. 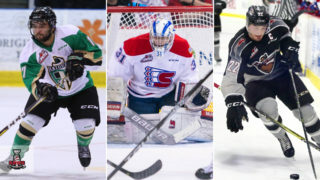 On Saturday, the Raiders host the Moose Jaw Warriors on WHL Suits Up with Don Cherry to Promote Organ Donation Night Presented By RE/MAX. The Raiders will be wearing special jerseys that night when they take on the Warriors that are available now via auction on 32auctions.com. Bidding closes on Monday, February 4 at Noon. 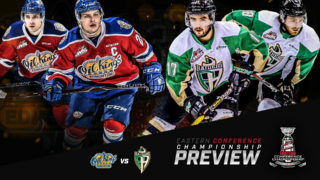 Both games begin at 7 p.m. Tickets are available at the Raider Office and at raiderhockey.com.